Hot Standby Routing Protocol (HSRP) is Cisco standard of providing redundancy for IP host configured in a LAN network with default gateway address.It enables a set of router interfaces to work together to present the appearance of a single virtual router or default gateway to the hosts on a LAN. A single router that is elected from the group is responsible for the forwarding of the packets that hosts send to the virtual router. This router is known as the active router. Another router is elected as the standby router. If the active router fails, the standby assumes the packet forwarding duties. Although an arbitrary number of routers may run HSRP, only the active router forwards the packets that are sent to the virtual router IP address. Routers that run HSRP communicate HSRP information between each other through HSRP hello packets. These packets are sent to the destination IP multicast address 224.0.0.2 on User Datagram Protocol (UDP) port 1985. IP multicast address 224.0.0.2 is a reserved multicast address that is used to communicate to all routers. The active router sources hello packets from its configured IP address and the HSRP virtual MAC address. The standby router sources hellos from its configured IP address and the burned-in MAC address (BIA). This use of source addressing is necessary so that HSRP routers can correctly identify each other. Virtual MAC address that is composed of 0000.0c07.ac** where ** is the HSRP group number in hexadecimal, based on the respective interface. For example, HSRP group 1 uses the HSRP virtual MAC address of 0000.0c07.ac01. Hosts on the adjoining LAN segment use the normal Address Resolution Protocol (ARP) process in order to resolve the associated MAC addresses. 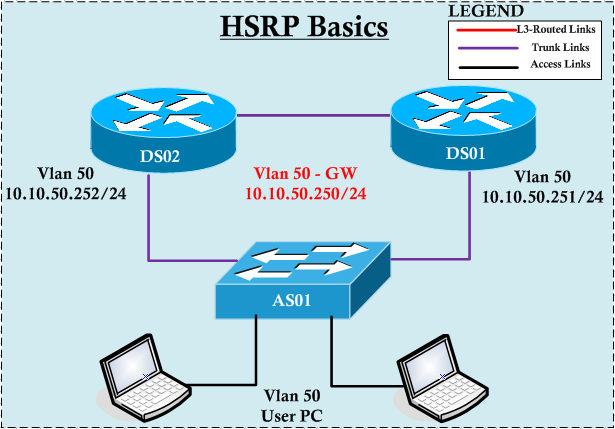 Even though HSRP group can be consist of multiple layer 3 devices, in typical enterprise environment distribution block (two aggregation switches) is configured with HSRP to provide gateway redundancy to all access layer VLANs. Below shows a typical topology which we are going to see how we configure HSRP. When we selecting HSRP Active, it is always good idea to select spanning tree root for that VLAN select as HSRP active for that vlan. To configure the HSRP parameters on this interface you have to use command syntax “standby <HSRP_Group> <HSRP_Parameter>“. All configurable options shown below (highlighted few commonly configured features). Minimum configuration wise you need to configure “standby <group> ip <virtual-IP>” in order to activate HSRP on an interface. In this example will configure HSRP Group no 50 ( a value between 0 -255). Therefore virtual MAC address should be 0000.0c07.0032 (where 50 is in hex 32). If you haven’t specify a group number it will assume group number as 0. So will configure “standby 50 ip 10.10.50.250” command on DS01 & DS02 vlan 50 interface. You can verify status of this HSRP group by issuing “show standby vlan 50” command as shown below. Here is the wireshark packet capture of a HSRP Hello packet with this default settings. As you can see DS02 has become active HSRP router. HSRP priority value determine who will become active. In this case both having same default priority of 100.If you want to ensure DS02 become HSRP active for this vlan you can configure higher priority value (between 1-255) on DS02. You can do that by using “standby 50 priority 200” on DS02 vlan 50 interface. In the event of DS02 failure, DS01 will assume the HSRP active role. But even DS02 came back after a failure, still DS01 will acting as active router. If you want to change this behaviour (ie make DS02 when it is available) you have to configure “preempt” on the DS02. You can do that “standby 50 preempt” command. When configuring preempt you can specify a delay when to preempt. It is good practice to configure a value thinking about your STP/IGP convergence & set a value suitable for your environment. Otherwise leave the default settings. CAT2(config-if)#standby 50 preempt delay ? If you want to make sure this HSRP is secure, you can configure Authentication for this HSRP communication. DS02(config-if)#standby 50 authentication md5 ? As you can see, default Hello Time is 3s & default Hold Time is 10s. If you want to make the HSRP fail-over occur more quickly you can change these values. In seconds, you can go to min 1s Hello Time. But if you want to make it further faster, you can specify in Hello Time in ms.
Make sure you change these timer values in all router in the same HSRP group. There are two version of HSRP. Version 1 & Version 2. By default it would be version 1 if you not specify the version. You can configure it “standby 50 version 2” command in our example. What are the difference between v1 & v2. Here is the full list of differences. 1. In HSRP version 1, millisecond timer values are not advertised or learned. HSRP version 2 advertises and learns millisecond timer values. This change ensures stability of the HSRP groups in all cases. 2. The group numbers in version 1 are restricted to the range from 0 to 255. HSRP version 2 expands the group number range from 0 to 4095. For example, new MAC address range will be used, 0000.0C9F.Fyyy, where yyy = 000-FFF (0-4095). 3. HSRP version 2 uses the new IP multicast address 224.0.0.102 to send hello packets instead of the multicast address of 224.0.0.2, which is used by version1. 4. HSRP version 2 packet format includes a 6-byte identifier field that is used to uniquely identify the sender of the message. Typically, this field is populated with the interface MAC address. This improves troubleshooting network loops and configuration errors. 5. HSRP version 2 allows for future support of IPv6. 6. HSRP version 2 has a different packet format than HSRP version 1. The packet format uses a type-length-value (TLV) format. HSRP version 2 packets received by an HSRP version 1 router will have the type field mapped to the version field by HSRP version 1, and subsequently ignored. 7. Note that HSRP version 2 will not interoperate with HSRP version 1. However, the different versions can be run on different physical interfaces of the same router. You can find more useful information from this HSRP-FAQ document from Cisco. Execellent write up.Loved every bit of it. especially the src/dst ip/mac. Thanks for your post. It solves my HSRP problem. If an access switch uplink to DS01 has failed how can we configure fail over so that DS02 become the active switch for vlan 50 using best practices? As long as DS01-DS02 connected via trunk link & vlan 50 defined on both switches with HSRP config on SVI, you should be good. Enable premption with higher priority , if you want particular switch to be active when both switches are up. Great post! Can this be used with WLC HA/SSO configuration, where each WLC of the pair is connected to a separate switch sharing the same HSRP subnet and gateway? I don’t mean 1 WLC to 2 different switches but WLCa to switch A and WLCb to switch B where WLC’s A and B are an HA pair.